We are dedicated to creating poster sized memorial mosaics for families of fallen soldiers. Mosaics for Heroes creates poster sized memorial Mosaics for families of our fallen soldiers. The families are not charged for this service. The Mosaics are created, printed and shipped to the family. Please Contact Us for additional information or to request a mosaic for your fallen soldier. Each Mosaic cost around $40 to make; this includes the printing and shipping costs. We rely on donations to help pay for these costs. We do not get paid for our time. The actual time it take to create a Mosaic takes around 2-3 hours. Each Mosaic is composed of thousands of tiny pictures which, together, are arranged to give life to the main Mosaic image; our Heroes. Why do we do this? Simple: To give back to those families who made the ultimate sacrifice. To let them know that we will Never Forget. Please click the GoFundMe link at the top of our page to donate. ​Your donation is greatly appreciated! 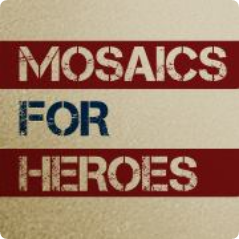 Mosaics for Heroes is a Non-Profit organization.